Different model organisms allow students to learn different science and research disciplines. Caenorhabditis elegans is an excellent model organism to study neuroscience and biophysics due to its availability, tractable nervous system, and it's observable behavior. 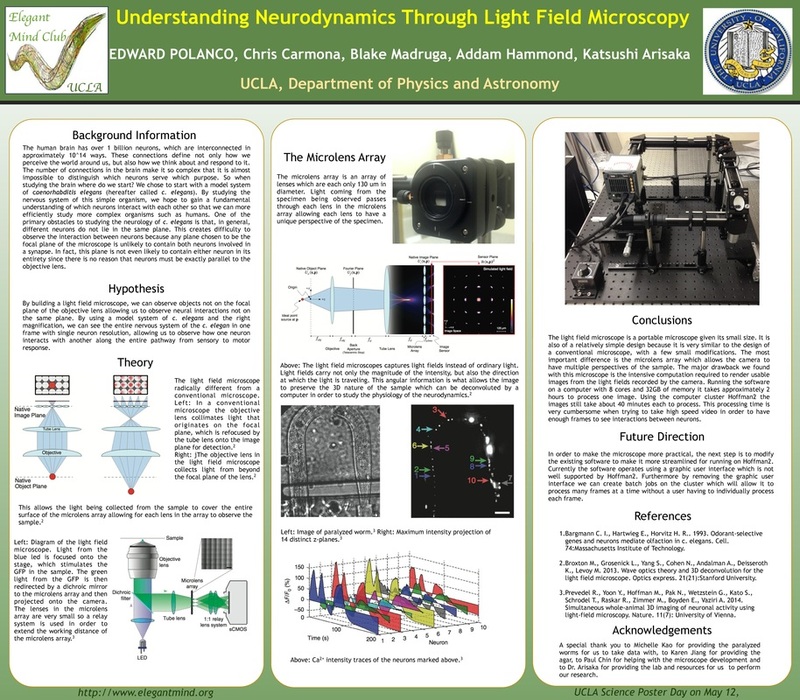 At the Elegant Mind Club at UCLA, we provide undergraduate students a unique hands-on experience working with C. elegans and present their own scientific methods of interest, allowing them to explore the nature of scientific research and understand the conclusions drawn from their data. In our laboratory, undergraduate students are entirely responsible for maintaining and culturing the worms along with building and improving their experimental systems. Direct involvement with the biological samples taught students the discipline of working with chemicals and maintaining sterility. Published papers and online resources such as WormBook, WormAtlas, and Caenorhabditis Genetics Center allow students to seek guidance from well-established methods. Manual practice in hardware permits students to strive for the most controlled and reproducible system for their experiment. As of now, systems for thermotaxis, electrotaxis, chemotaxis, phototaxis, durotaxis, as well as magnetic field and free motion have been reproduced and improved by our members. Our laboratory began with a few core members and has expanded to accommodate more than 80 students from different universities over the world and hope to encourage more students to approach scientific research with enthusiasm. Many organisms migrate efficiently towards an attractant or a preferred condition to increase survival. While C. elegans have been previously described as a primitive organism capable of moving towards an attractant by biased random walk and klinotaxis, their deterministic locomotion have not yet been extensively characterized. Here, we observe the movement of C. elegans with and without external stimuli by implementing different conditions: temperature gradient, electric field, and free motion. 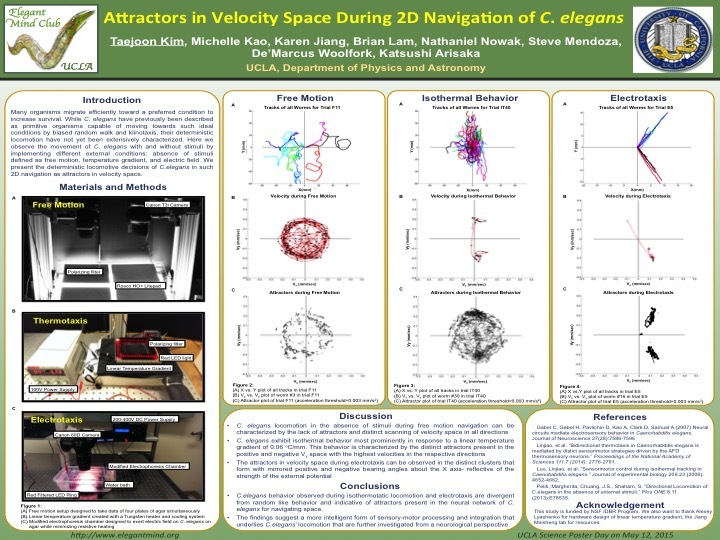 We compare their locomotive decisions defined by their movements in velocity space, (Vx , Vy). Their movements under each condition are first recorded and analyzed separately to characterize their locomotive decisions under that specific condition. The different conditions are then compared within the physical realm of velocity space. Their deterministic movements can be clearly distinguished in their distinct directionality and speed based on the plots presented. The absence of stimuli invokes locomotion that is characteristic of random search. In comparison, the presence of specific external conditions sanction a more deterministic locomotion, which can be reproduced with a high degree of accuracy. We present such locomotion as being divergent from random behavior and indicative of a neural network for C. elegans to navigate space. 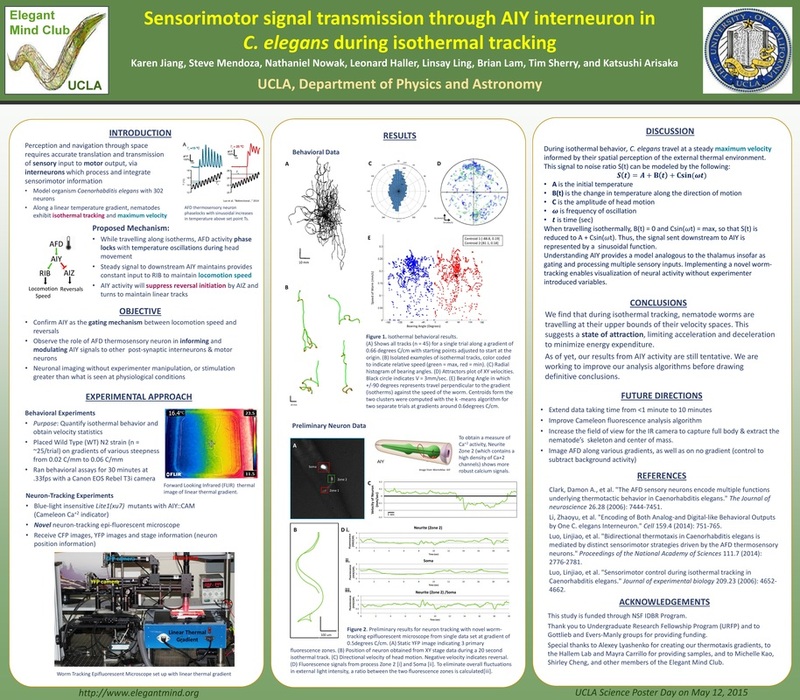 The findings suggest a more intelligent form of sensory-motor processing and integration that underlies C. elegans’ locomotion that are further investigated from a neurological perspective. Perception and navigation through space require accurate translation and transmission of sensory input to motor output. On a linear temperature gradient, Caenorhabditis elegans demonstrate a distinct behavioral phenotype in which they frequently travel along isotherms, maintaining sensitivity within 0.05 degrees C. This isothermal attractor state is correlated with movement at a constant and maximal velocity. We investigate how AIY, a first layer interneuron and postsynaptic partner to AFD thermosensory neuron, is able to integrate thermal information to return specific well-defined behavioral phenotypes. Prior observations of neural activity in vivoinvolve partial paralysis or constraint of the worm while stimuli is applied. Other systems circumvent this limitation by re-centering the stage; this generates an external force during stage acceleration introducing another stimulus. We overcome these two primary obstacles through the implementation of a novel automated worm-tracking epi-fluorescent microscope. The three-camera microscope system mounted on a movable XY stage captures dynamic Ca+2 signals in Cameleon-labeled neurons while the nematode navigates unconstrained along the temperature gradient. Implementing this set up, we observed that the greatest temperature difference occurs between the extremes of the head movement while along isotherms which phase lock with fluorescence response in AIY. The steady Ca+2 waveform in AIY suppresses reversals and maintains high speeds to downstream motor circuitry. Mechanosensation is clearly defined in the model organism Caenorhabditis elegans, however mechanotaxis, more specifically the subset of this behavior termed durotaxis has not been explored. 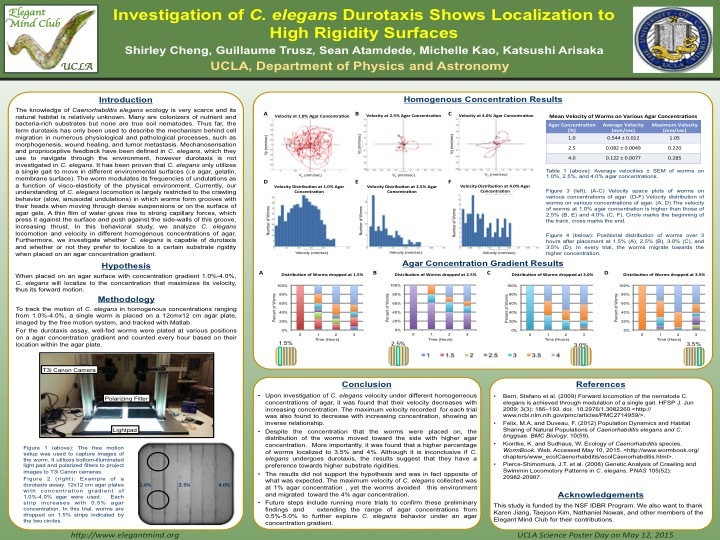 To date, durotaxis has only been investigated in cell motility in the extracellular matrix (ECM). C. elegans are nematodes that navigate through the environment by means of mechanosensation, chemotaxis, thermotaxis, and phototaxis. Therefore they are capable of receiving and processing sensory input to respond accordingly, similar to certain cell types in the ECM. It has recently been identified that C. elegans has a single sinusoidal locomotory gait when moving through different substrate conditions. In lab, culturing C. elegans is maintained on an agar medium and are limited to a crawling behavior. However, we question if that is the best condition for culturing C. elegans and if they are capable of distinguishing between different substrate rigidities. We venture to see if C. elegans is capable of durotaxis after being placed on an agar gradient. Upon investigation of many combinations of agar concentrations ranging from 0.5%-4%, C. elegans primarily localized to the substrate with higher rigidity. Independent experiments with homogeneous agar concentrations also show that 3% agar allowed for optimal motility and velocity of C. elegans. These primitive findings demonstrate that C. elegans can indeed sense different surface rigidities and provide additional insight to its locomotory navigation in its natural environment. Worm tracking of freely moving worms is essential to study the connection between behavior and neural activity. However, these microscopes are often limited in their ability to track worms under various behavioral simulations. We present a fluorescence worm tracking microscope that has an open geometry and thus can track worms even if the behavioral platform is difficult or impossible to move via a motorized stage. As opposed to other automated worm tracking systems, our microscope is fully mobile--where all the optical components are mounted on top of a motorized xy stage--while the sample stage where C. elegans rests is stationary. 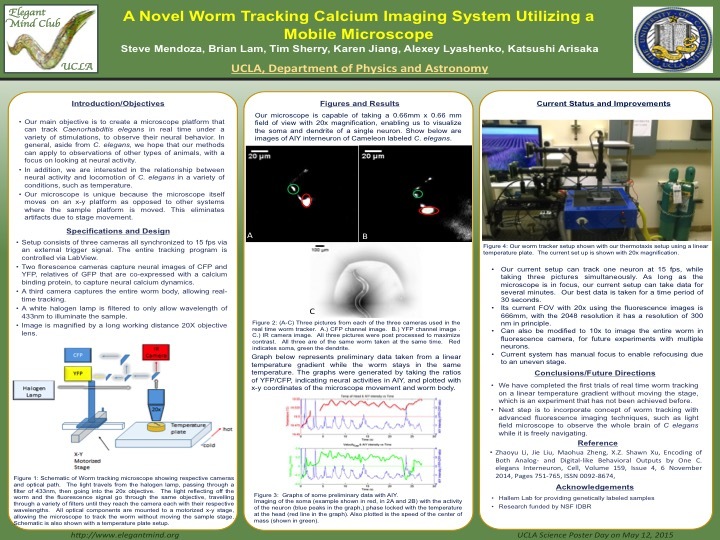 This platform allows for ratiometric calcium imaging while also tracking a dark field worm image for behavioral analysis, running at 15 frames per second. The current configuration has three cameras, two for each of the YFP and CFP channels, and a dark field image showing the worm body, under a 10x magnification; the microscope can also be adjusted to image at 20x. Being able to track freely moving worms without moving the sample stage, allows our microscope to perform worm tracking in experimental conditions that similar systems have not been able to achieve. In addition, since the sample is stationary, we also avoid introducing confounding effects on the worms due to stage acceleration. To test this novel hardware, we run a thermotaxis experiment tracking a worm without moving the temperature platform. Our worm was labeled with AIY::Cam and we find a correlation between the AIY activity and the temperature of the head location during isothermal behavior. Our methodology could also apply to other behavioral experiments where an external stimulus would be hard to move via a motorized stage, such as an electrotaxis experiment. A Light Field Microscope is an epifluorescent light microscope that allows us to image a specimen in three dimensions. Humans can accomplish this with our eyes and brain by taking two separate images and further processing it to determine relative depth of objects. In a microscope, this is made possible by a microlens array, which is a matrix of lenses on the order of 100um in diameter that can each resolve a full visual perspective of the specimen being imaged at relative distances from the native object plane. A light-field is projected onto the detector in the camera, each lens provides spatial and angular information in the same manner as our eyes. The image that is captured can then be processed by computational methods in order to construct a three dimensional image from the information recorded by the camera. This microscopy technique has the potential to record high quality 3D videos and images in real time during unrestrained behavior of C. elegans. This allows us to study the interactions of neurons not on the same spatial plane while also keeping the neurons in focus. This in turn allows the study the neurodynamics of C. elegans on an unprecedented level to better understand the nervous systems of more complicated animals. Sheet Illumination has recently gained a lot of attention as a technique, due to many benefits over standard microscopy methods. Decreased phototoxicity, increased signal to noise ratio, and higher photon efficiency are only a few of the reasons why many researchers are beginning to answer sensitive scientific questions with sheet illumination microscopy. Here, a bessel beam is formed through the use of an axicon lens, to generate a long, thin beam with deep-penetrating, self-reforming properties, which is then scanned to the sheet through the use of a galvano scanning mirror. Positioned at 90 degrees to the working distance of the illuminative lens, is a large working distance, refractively corrected detective objective, specifically designed for the observation of clarified tissue samples, such as CLARITY-treated neural tissue, along multiple wavelength channels. Utilizing several high accuracy linear stages, it is possible to take many data sets continuously, to acquire three dimensional information on the order of 1cm cubed, with sub-micron spatial resolution. 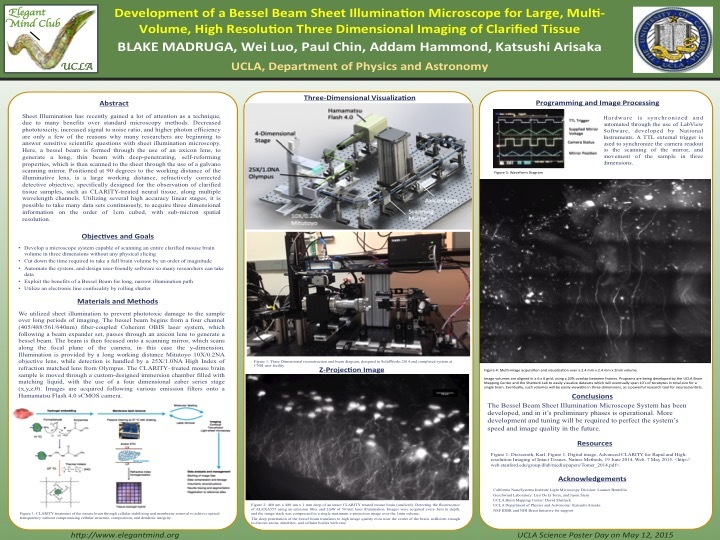 Sheet Illumination microscopy has made a large impact on the microscopy community due to its many advantages. Increased photon efficiency allows for lower power light sources, which in turn reduce phototoxic damage to the sample, while providing an increased signal to noise ratio. To take advantage of this technique, a type of phase modulator, known as a Spatial Light Modulator (SLM) is used to generate a deep-penetrating, extremely long and narrow bessel-beam pattern. Through the use of an SLM, one can easily modulate multiple characteristics of the illuminative beam in real time, enabling greater flexibility, ensuring high resolution across multiple scientific applications. A piezoelectric objective collar is used along the detective axis, to enable fast z-dimensional scanning in depth, thereby creating three-dimensional volumes with adequate time resolution to characterize and observe active neural dynamics in several hundred neurons. Such tools will enable the study of large-scale neuronal activity under controlled or experimental conditions across multiple model organisms.